Syreden is a country split in two. 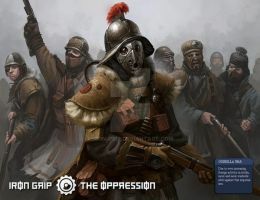 During the Erosian invasion, much of the resistance was forced underground, where a combination of skilled tunneling and guerrilla tactics eventually allowed them to win back their country in a successful revolution. As a result, many residents remained below ground, sculpting out massive underground cities. 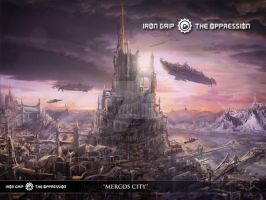 The artwork depicts one of these Eastern Syreden cities. It so much makes me want to be there, to be able to walk around in that place. oh this is beautiful! I love the train there too and the water. I don't know anything about Syreden, but love this picture. Wow! Is this all original work and story from you? If so, tis quite impressive! Effin' amazing! Makes me wish i could be there.